The Josep Carreras Leukaemia Research Institute (IJC) Campus ICO-GTP houses the Germans Trias I Pujol Hospital and Institute (IGTP-HUGTP) Biobank Sample Handling Circuit, which manages the processing and storage of voluntarily donated samples of haematological neoplasms. The samples are stored in the collection entitled “IJC Leukemia and other blood disease Sample Collection’. The IGTP-HUGTP Biobank Sample Handling Circuit receives the bulk of its samples from the Catalan Institute of Oncology at the Germans Trias i Pujol Hospital (ICO-HUGTP). Samples received from other hospitals are processed in an identical way. All samples in the collection have an attached Informed Consent Form approved by the ICO-HUGTP Ethics Committee and signed by the patient in triplicate, one copy remains at the IJC. The patient maintains the right to revoke consent at any time and in this case the samples concerned will be destroyed. Dr Francesc Solé, Scientific Director IJC Campus ICO-GTiP is the registered manager of the collection and the legal ownership is under the name of Carles Esquerré (Managing Director of the IJC). The samples received are processed by IJC personnel following the Circuit’s own established protocols. The IJC provides storage of the samples. Plasma and serum samples are kept at -80ºC and the isolated cell populations for each sample are cryopreserved in liquid nitrogen tanks. The technical staff of the IJC have created a database of patients, donors and samples received and processed according to required specifications for the tracking of each sample in the collection. The staff verify the quality, security and tracking of the data and samples throughout the process and starting at extraction. The IJC implements a knowledge management system to document, guarantee tracking and the confidentiality of the registers according to the current legislation (Organic Law 15/1999 for Personal Data Protection). 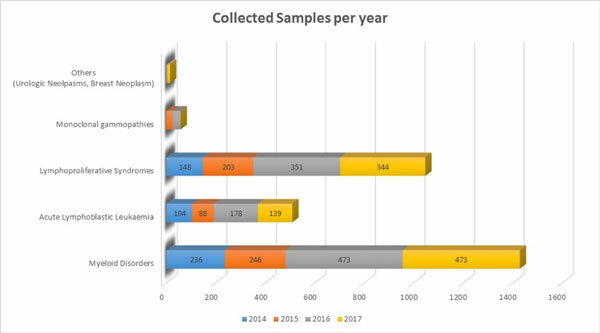 The following figures and table show the number of patient samples received by each work group since 2013.